It is spring time, the weather is fine, and good-natured Mole patience with his spring cleaning and dares to leave his underground home, heading up to take in the air. He ends up at the river, which he has never seen before. Here he meets Ratty who spends all his days in and around the river. Rat takes Mole for a ride in his rowing boat. They get along well and the two of them spend many more days on the river, with Rat teaching Mole the ways of the river. Some time later, one summer day, Rat and Mole find themselves near Toad Hall and pay a visit to Toad. Toad is rich, jovial and friendly, but conceited, and tends to become obsessed about things, only to dismiss them later. Having given up boating, Toad's current craze is his horse-drawn caravan. In fact, he is about to go on a trip, and persuades the reluctant Rat and willing Mole to join him. A few days later, a passing motor car scares their horse, causing the caravan to crash. This marks the end of Toad's craze for caravan travel, to be replaced with an obsession for motor cars. Mole wants to meet Badger, who lives in the Wild Wood, but Rat knows that Badger does not appreciate visits, and so refuses to take him, suggesting that if Mole will wait, Badger himself will pay a visit. Nevertheless, on a winter's day, Mole goes to the Wild Wood to explore, hoping to meet Badger. He gets lost in the woods, succumbs to fright and panic and hides among the roots of a sheltering tree. Rat goes looking for Mole, and finds him, but it starts to snow and even Rat no longer knows the way home. By chance they arrive at Badger's home. Badger welcomes Rat and Mole to his large and very cosy home, and gives them food and dry clothes. Badger learns from Rat and Mole that Toad has crashed six cars and has been hospitalised three times, and has had to spend a fortune on fines. Though nothing can be done at the moment (it being winter), they decide that once spring arrives they should do something to protect Toad from himself, since they are, after all, his friends. With the arrival of spring, Badger visits Mole and Rat to do something about Toad's self-destructive obsession. The three of them go to visit Toad, and Badger tries talking him out of his behaviour, to no avail. They decide to put Toad under house arrest, with themselves as the guards, until Toad changes his mind. Feigning illness, Toad manages to escape and steals a car. He is caught and sent to prison on a twenty-year sentence. No longer needing to guard the now-absent Toad, Rat visits his old friend Otter and finds out that Otter's son is missing. Rat and Mole set out to find him. They receive help from the god Pan who leads them to the location of the missing child. Pan removes their memories of this meeting "lest the awful remembrance should remain and grow, and overshadow mirth and pleasure". In prison, Toad gains the sympathy of the jailer's daughter, who helps him to escape. This involves disguising Toad as a washerwoman. Having escaped, Toad is without possessions and pursued by the police, but he shakes off his pursuers with the help of the driver of a steam train. Still disguised as a washerwoman, Toad comes across a horse drawn boat. Toad lies about being a capable washerwoman to the owner of the boat, who offers him a lift in exchange for his laundry services. Toad, however, proves to be incapable at washing clothes, and he gets into a fight with the boat owner, steals her horse, and sells it to a gypsy. Hoping for a ride home, he flags down a passing car, which happens to be one he stole earlier. However, the owners don't recognise him in his disguise, and give him a lift. Toad asks if he can drive, and is allowed to. He hijacks the car and kidnaps the passengers, which of course quickly leads to an accident. He flees, and by chance arrives at Rat's house. Toad hears from Rat that Toad Hall has been taken over by weasels, stoats and ferrets from the Wild Wood, despite attempts to protect and recover it by Mole and Badger. Although upset at the loss of his house, Toad realises what good friends he has, and how badly he has behaved. 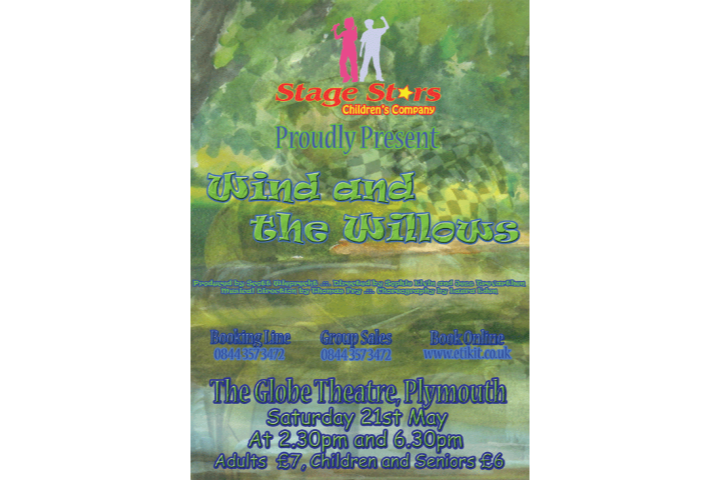 Badger, Rat, Mole and Toad enter Toad Hall via a secret entrance and drive away the intruders. Toad makes up for his earlier wrongdoings by seeking out those he wronged and compensating them. The four friends live out their lives happily ever after. 11. He Can't Be Stopped!